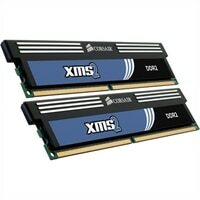 4 GB 800 MHz 240-pin XMS Dual Channel DIMM DDR2 Memory Module KitIncreasing the memory of your system is a good way to improve its performance. Additional memory allows you to open more applications simultaneously while providing the power needed to make them run quickly. It enhances the performance of your system allowing you to work faster and reap improved performance of up-to-date applications and operating systems. Plug-in the 4 GB Memory Module kit with XMS heat spreader from Corsair® and you will notice that everything starts working smoothly. Increasing the memory of your system is a good way to improve its performance. Additional memory allows you to open more applications simultaneously while providing the power needed to make them run quickly. It enhances the performance of your system allowing you to work faster and reap improved performance of up-to-date applications and operating systems. Plug-in the 4 GB Memory Module kit with XMS heat spreader from Corsair® and you will notice that everything starts working smoothly.